NOTE: This review is part of Free Music February and a revision of a review originally posted on December 22, 2012 on AbsolutePunk.net. The title of folk-rock artist Marc M. Cogman’s third release Anthems is confusing at first, as nothing in the actual work suggests much of anything very anthemic. The production is scratchy and unpolished, often letting louder dynamics blur together in an angry haze. The instrumentation is right out of the folk playbook, utilizing pianos, guitars, drums, and little else. The lyrics rarely deviate from its author’s personal tribulations. Yet that’s precisely where its value as an anthemic work comes from: it aims not to please a crowd but finds its power in the individual struggles we all face in the name of love. Cogman leaves himself to grapple freely with his thoughts and ambitions, and the result is just as complex as his relationships: angry then hopeful, bitter then euphoric, detached then engaged—and throughout this rollercoaster ride of emotion, both relatable and uplifting. “In the night, a spell was broken, and tore me from a dream. And I woke up alone, no one lying next to me. And I had nowhere to go, but I still got up, ‘cause these days I can’t sleep. So I pulled out the old typewriter, the one you gave to me. And I wrote another song about our bitter history. Opening track “Typewriter” is a solid setup for what we’ll be seeing Cogman do in these ten tracks: a simple piano line laid over the gentle strums of an acoustic guitar provides a ground on which his gravelly voice can begin to lay out his story. It helps that Cogman’s an excellent lyricist, able to tackle the all-too-common themes of love and loss without coming off as melodramatic or conceited. He’s also painfully aware of the role his art serves. As seen above, catharsis through songwriting is a theme revisited more than once in this work. “I’m not out for revenge; I just like healing quickly. And I’m grateful for all the pretty things that stepped on me. And these are the thoughts that no one wants to speak out loud. 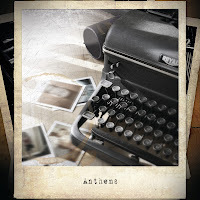 Though these affairs may be personal, the majority of Anthems consists of Cogman’s attempts to distance himself from his emotions and approach something resembling objectivity—oftentimes to shockingly dark ends. “Understudy”, for instance, sees him talking about a rebound partner in the context of the heartbreak he’s just suffered through. “Every day another piece - the polaroids and poetry: I phase them out with new routines. No, I won’t learn to love her but I can learn to love deceit,” he confesses over undercurrents of guitars furiously buzzing and drums pounding his bitterness away. Hushed ballad “The Rest Of My Life” explores similar territory, as he sings of “a bag packed in the car from the trip we didn’t take” and concludes at verse’s end that “I’m not ready to get over you tonight.” In the background, the soft plucks of guitars slowly rise as the drums finally enter the fray to carry them away. It’s a majestic counterpart to the shattered, prickly edges of “Understudy” and another face of Cogman’s private miseries. That isn’t to say, of course, that Cogman can be sweet when he needs to be: it’s just that he has a tendency to temper even his highs with a bit of sadness. The temperament of “Snowflake”, for instance, can only be described as icy-warm: the twinkling pockets of xylophones and gently thudding toms may sound breathtaking, but Cogman’s lyrics, as always, twist the knife even when there’s no wound to puncture. “Safe”, meanwhile, is upbeat in the verses but quiets down in the chorus, as he repeats “Ease up now, it’s safe in here,” so many times that it’s almost as if the person he most needs to assure is himself; the grungy guitar solo howling over the climax of the track is only the natural culmination of his anxieties. Though the majority of Anthems is rather subdued, it’s in the rare moments when Cogman lets loose completely that all of its pieces begin to come together. “Need A Hero”, the penultimate track, sees him laying his soul bare in desperation for somebody that he can only watch self-destruct, unable to do anything. “But it’s out of my hands, it’s out of my heart. I know you need help, I’ve known from the start,” he reflects with regret before he raises his voice in the chorus: “You can cry for me, I’ll come running, but you need a hero, and I’m not him,” he wails. The moment is an effective microcosm of the entire album, in which fleeting sparks of genuine love are inevitably dampened by harsh realities, worst of all time. At first, “God Forbid” is a bit of an anomaly. Stuck at the very end, it’s by far the rawest track to be found on Anthems, with almost no production to speak of whatsoever. (Then again, there’s nothing much to produce: this is just Cogman alone in his room with his guitar.) Far from providing anything resembling hope, the melodies are dark, hopeless, and unresolved, and the lyrics are just confusing. Strange as it may be to end on the most downbeat track, however, it ends on a brief note of closure as Cogman puts down the guitar, gets up, and leaves the room. Ultimately, the last thing we hear on Anthems is the closing of a door—and presumably the opening of new ones. If at times my writing makes Cogman's work sound like some ancient old tome, that’s because it was, in fact, intended for a different time. The liner notes testify that some songs had been written as early as 2003, and most of them had been ready to go by 2008. From there, it was an uphill battle with personal struggles, funding, and touring before a release date was finally stated: March 2012, three years after Cogman had initially planned for it to be released. You can download all of Marc M. Cogman's work for FREE on his Bandcamp page and find more info on him on his official website. His fourth release, Albatross, is slated for release in 2013.